Have you heard the news? Southern Weddings is headed to the Lone Star State in March for our first two V8 editorial shoots! I have a soft spot for this trip, since Texas is my home state, and my fellow Texans had better believe that I am on the edge of my seat with excitement to introduce Emily to Torchy’s Tacos, South Congress, and of course, my old stomping grounds of the Forty Acres. We are currently looking for reader models in both Houston and Austin, so if you’re interested in applying, find all the details here. Also, keep an eye out for information about vendor and reader meet-ups (and Southern Weddings Shop pop-up shops!) in both cities coming soon–we would love to meet you! See more from this engagement session by Cassidy Carson Photography on our Facebook page! Our favorite Bachelor, Sean Lowe, shared his favorite thing about marriage in Sweet Tea Sunday. We answered the tough question of who pays for the wedding in Ask SW.
Valerie and Tyler’s Louisiana home is simple and cozy–read all about it on Southern Newlywed. This rainy wedding film couldn’t be sweeter! Julie and Michael‘s Louisiana wedding (as seen in V7!) combined family heirlooms and DIY details. Camille and Austin transformed Camille’s family farm into a gorgeous venue for their wedding day. Katie and Zach buried a bottle of bourbon before their gorgeous (and sunny!) Virginia wedding. Kristen and Kevin pulled inspiration from so many lovely sources at their Florida wedding. Our dear friend and Blue Ribbon Vendor, Katelyn James, just launched her gorgeous new branding, and is doing an amazing giveaway in conjunction with it–for a wedding! Along with photography by Katelyn, of course, the winning couple will get to work with more incredible vendors for a celebration at Big Springs Farm. The couple will also be given one of our own Southern Weddings Planners to help them plan a meaningful beginning to married life! Find all of the details and enter by February 2 at midnight here! Thank you so much for sharing!!!!!! xoxoxo! Friends, there is so much to love about today’s home tour, our kick-off of 2015! My first impression of Val and Tyler’s bungalow was that it was simple, calming, and clutter-free, so I wasn’t surprised to read that that’s the look they’re going for: “Having a peaceful, simple home is super important to us. We have places in our home that look bare and probably unfinished to others, but to us, it is perfect. It is so easy to outgrow a house, simply by filling it with too much stuff.” Read on for much more wisdom from this sweet and creative pair, and an exciting discount from Val’s shop! Big hugs to Ashleigh Jayne for these lovely photos! Tell us a little bit about yourselves. 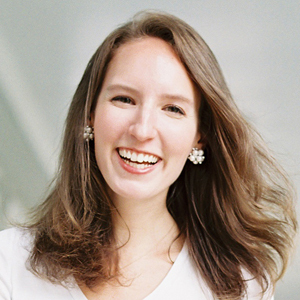 Valerie is the owner of Val Marie Paper and designs wedding stationery and prayer journals. Tyler is owner of Pixelbrush Studios and develops websites. Two business owners means date nights involve trying to figure out how many tables a restaurant has to seat to turn a profit or daydreaming about our goals. Tell us your love story in one sentence. We became best friends and stayed that way for a year and a half, tried to start a business together (! ), and finally realized we wanted to be best friends for life. What is your favorite part of being married? The laughter. We are so silly and weird together. That feeling that you are totally accepted just as you are is amazing. What has been the most surprising thing about marriage? You hear people talk about getting comfortable and the relationship changing from puppy love to becoming an old married couple, but that isn’t necessarily a bad thing. There are incredible perks to being an “old married couple.” You learn to communicate, so big fights are now short “discussions,” and once you learn how to be a “we,” you are more laid back with things. Tell us a little bit about where you live. We just bought our first home this past summer. We live in traditional neighborhood development and are surrounded by family. There is always something fun happening here! Tell us about the process of moving in together. This was pretty easy. Tyler tells everyone his life was definitely upgraded when he got married–sheets on the mattress, purified water filters, and everything! ;) Our style has developed and changed over the years, especially as we’ve both had to hone in on our business brands. It has influenced our home life tremendously, and we are much more confident with our style now! Which room in your home is your favorite, and why? Our living room. We have almost two walls completely covered in windows that overlook a bunch of big oaks and our porches. What most makes your house feel like home? Our house was prayed for for so long. Being here is a constant reminder of how God’s plan is so much bigger (and better) than ours. We were originally going to build a house somewhere else several years ago, but Tyler got cold feet. I was devastated and tired of waiting, but didn’t want to push it if God was leading him in this decision. Had I forced it, we never would be where we are now! There are days when I’ll start the “I wish our house had…” and I have to snap back to reality and gratitude for the many blessings we have. Where do you splurge and where do you save when decorating? We splurged on the house, which has great bones, so we’ve been able to save on actual items. We have tons of Ikea furniture, World Market pieces, and hand-me-downs. What is your favorite memory from your wedding? Two moments really stand out for me. We wrote our own vows and shared them with each other for the first time during our first look. Also, when we got to the front of the aisle, I took a deep breath and looked out at all the faces in the crowd. This was my way of switching gears and slowing down to enjoy the celebration. How do you remember your wedding in your home? We have our favorite print from our wedding hanging in our bedroom and a shelf in our living room with our wedding album and polaroids. Which items from your wedding registry do you use the most often? The dishes. We got simple ivory dishes from Bed, Bath & Beyond. They definitely seemed like a boring choice at the time, but we still love them! What different decisions, if any, would you make for your registry if you knew then what you knew now? A nicer knife set. We got one of the least expensive ones because we thought knives were knives. It’s already time to invest in a new set! Who cooks dinner? Tyler does! This started when I was nauseous while pregnant with Vivi. I never really took the kitchen back over once we realized he was the better cook! What is your go-to weeknight meal? Weekend meal? Tyler gets so creative, we rarely have the same meal twice, but he does indulge me by serving a lemon chicken pasta from The Pioneer Woman every few weeks. In the winter on weekends, it’s a chicken and sausage gumbo. How does your family handle finances? Do you use a set budget? I handle the daily finances and Tyler is in charge of big picture finances (like retirement and taxes). What’s your best tip for balancing your relationship and other life priorities? We just started doing a family meeting on Sunday mornings during a big, relaxing breakfast before church. We go over each other’s schedules and any special things we need to know. I also talk about un-fun topics like health insurance and other things that I don’t like to bog our weeknights down with. Do you have a favorite date night idea to share? Our favorite at-home date nights involve what we call the “super couch.” We move our mattress into the living room and eat take out in bed and watch a movie! After a long work day, it’s the perfect way to relax. What is one small way you love or serve your spouse? I tidy the house before he gets home and always try to greet him at the door with a smile and a kiss! Do you have children? What are your hopes and plans for the future in this area? Yes! One sweet 16-month-old named Vivi Mae. We are hoping to add to our family soon! Before getting married, I wish someone had told me… more of the positives and less of the negatives. I know it’s good to be prepared, and I don’t think we need to hide the hard stuff, but I remember being engaged and burnt out hearing about how hard things were going to be for the first week/month/year. Is there anything else about your home or family life that you think our readers would be interested in? Having a peaceful, simple home is super important to us. We have places in our home that look bare and probably unfinished to others, but to us, it is perfect. It is so easy to outgrow a house, simply by filling it with too much stuff. Living in a two-bedroom, 800-square-foot apartment with a newborn and a stationery shop taught us so much about simplifying our things. Our mission when we doubled our space with our new home was to not lose the white space, and instead, to embrace it. We’re so grateful to Val and Tyler for sharing their hearts and home with us! Be sure to follow along with Val on her blog and on instagram. And be sure to stop by her shop – Val just released her “Marriage Field Guide,” a conversation-starter and guide for married and engaged couples. She’s offering 10% off to y’all with code ILOVESWMAG! Yes! Emily, it is so nice. I think we both were a little nervous at first but it’s been a great thing! What brand are the shades on the bedroom windows? Love the simplicity of this home! It is beautiful. If you do not mind me asking, what is the name of the blue paint color you used in the bedroom? It is lovely. By far one of the most popular and memorable details at my wedding was the lounge spaces we set up in our reception tent. Yes, people remember the ceremony and the music, but what people bring up most two years later is how much fun they had catching up with friends and family on comfy couches in a beautiful space (with the ability to pop back and forth to the dance floor!). It’s a great example of what’s true about weddings: people may not remember what you said or what you fed them, but they will remember how you made them feel. A feeling of inclusion and hospitality is a major wedding do, and a reception lounge can be a big step toward that! While lounges can be set up in many locations, we happen to think that Sperry Tents make the absolute perfect back-drop. And we’re not alone! In one of my earliest conversations with our florist (who had a Sperry Tent for her own wedding), she said, you know, the nice thing about a Sperry is that they are so beautiful, and create such an experience on their own, that you don’t really need much in the way of extra decor. Not needing the smaller details frees your budget up to include more substantial details, like a lounge space! As you can see, Sperry Tents are a classic, neutral backdrop that works with every aesthetic and location, from a field to a beach to a manicured backyard. The tents are handcrafted by sailmakers in coastal Massachusetts and are made from genuine sailcloth, and the wooden support poles are hand-milled at a historic 1930s sawmill. All of their design decisions prioritize craftsmanship – you can really feel the love that went into each one when you’re standing inside! In case you’re wondering, in my experience, Sperry Tents are more expensive than a standard frame tent (though obviously with good reason). If you start to add anything to the tent like a liner, draping or pole covers, however, the price will usually exceed a Sperry! — Search out rental options. Vintage rental companies are popping up left and right (we have several stellar options in the Blue Ribbon Vendor Directory!) and traditional rental companies are adding more lounge options as their popularity grows. There are options to fit every aesthetic, from shabby chic to ultra modern. — Plan carefully if using your own pieces. For my wedding, we decided it was more cost-effective to purchase pieces to supplement our rental couches rather than buying everything. We bought several Ikea Lack tables and white ottomans and then were able to either sell them after the wedding (on Craigslist!) or give them away. If you go this route, however, make sure that you have the vehicle necessary to transport your items to your venue, and that someone is assigned to pick them up post-wedding! — Make a diagram. I don’t know about y’all, but spatial issues are not my forte, and when faced with trying to figure out how to fit our couches and our tables and our bar AND our dance floor in our tent, I was baffled. Enter: Sperry’s AMAZING space planning tool. 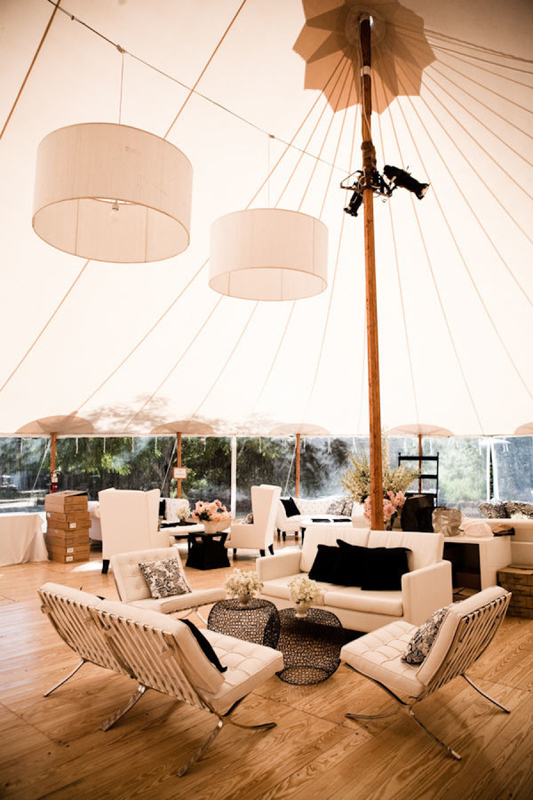 After selecting your tent size and shape on their website, you can add and play around with a ton of different decor options to come up with the perfect arrangement, including lots of different lounge configurations! SO helpful. Interested? Sperry Tents are only available through a network of licensed providers and are available for rent throughout the South. You can find out much more on their website here!